With automation, you can make sure each subscribed contact gets a custom birthday message or promotional offer on the right day for them. 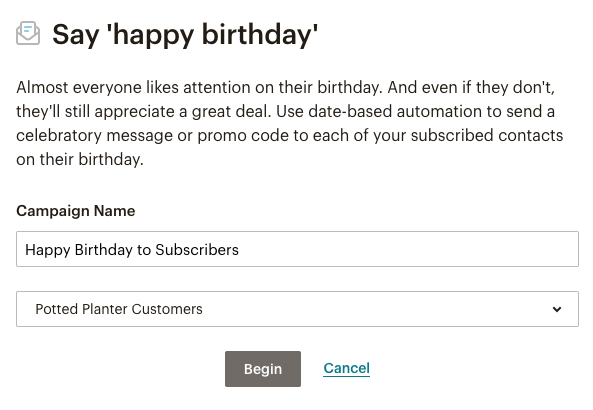 Mailchimp can send a friendly email to your subscribers to wish them a happy birthday on, before, or after their actual birthday. In this article, you’ll learn how to send an automatic birthday campaign to your subscribed contacts. Setup for this automation has a few steps. To create a birthday campaign, you’ll first need contact birthday information in a Mailchimp Birthday field. This is an audience field where you’ll store the dates in MM/DD (Month/Day) format. A regular date field in MM/DD/YYYY (Month/Day/Year) format won’t work with this type of automation. If you don’t have any birthday data yet, add a birthday field to your signup form to collect this information from contacts when they sign up. If you already have birthday data, you can update your audience with an import. 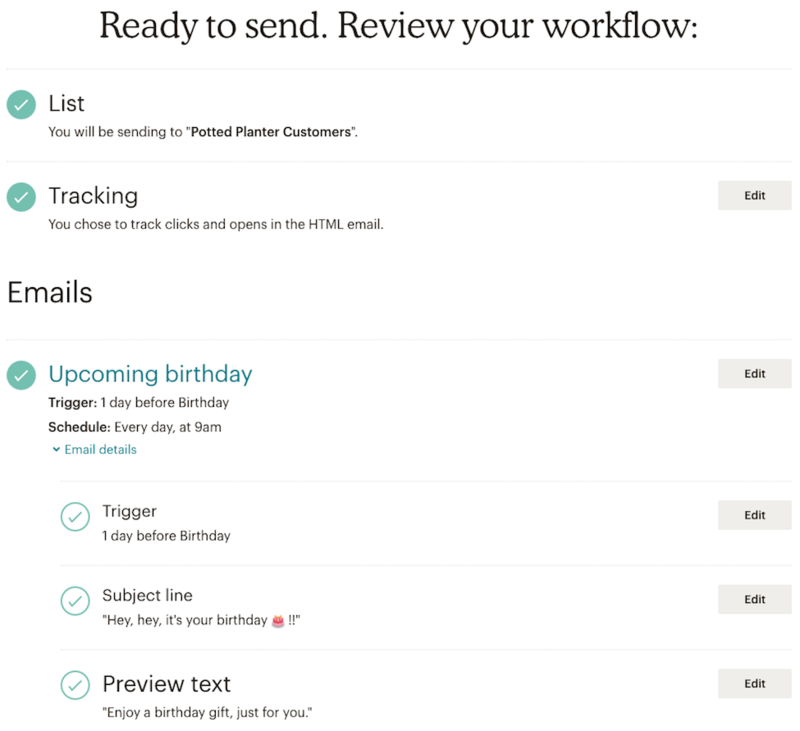 Now that you’ve got a birthday field in your Mailchimp audience, it’s time to get started on your email. By default, the automated birthday campaign is a 3-email series that sends before, on, and after your subscriber’s birthday. You can change this to send more or fewer emails if you want. To create an automated birthday campaign, follow these steps. First, decide how many emails you want to send, and add, reorder, or delete emails from the series. Then, you’ll be ready to design your birthday email or email series. 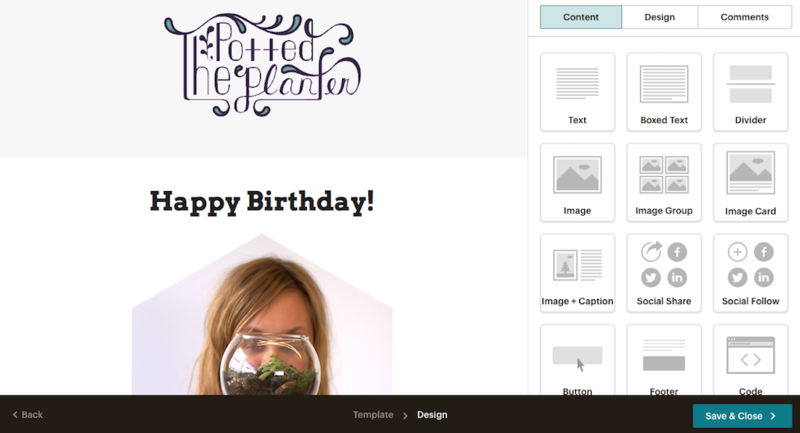 If you need a little design inspiration to get started, check out our birthday email tips. To design your automation email, follow these steps. Click Design Email next to the email you want to work with. On the Setup step, name your email, then enter the subject, preview text, from name, and from email address. On the Template step, select your template. On the Design step design your email. Try the Preview and Test drop-down menu to access powerful testing tools to see how your email will look to subscribers. After you design your first email, repeat steps 1-6 for any other emails in your automated Birthday series. After you design your automation, preview and test, and check your workflow settings, you’re ready to launch. We’ll handle the rest! To launch your automation, follow these steps. On the Emails step of the Automation Builder, click Next to continue to the Confirm step. Review the checklist and click Resolve or Edit to make any necessary changes. When you're ready, click Start Sending to start sending your automation. In the pop-up modal, click Start Sending to confirm. It’s a party! 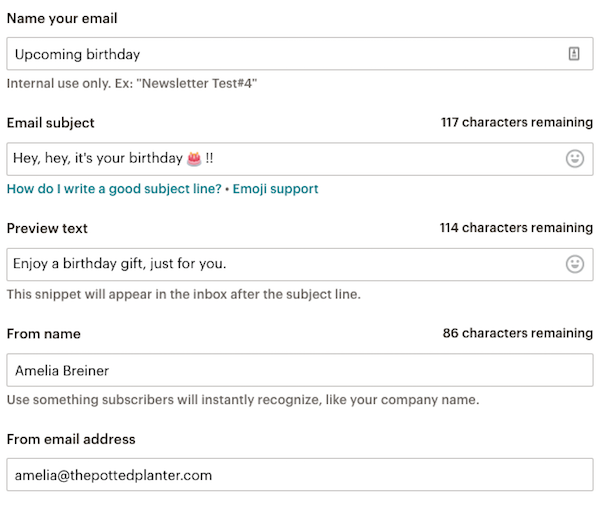 Now your subscribed contacts will receive birthday emails from you. You can verify that someone received a birthday email in their subscriber profile, or the automation report. A good birthday email helps subscribers know you care, and can also encourage them to make a purchase. Here are some tips to ensure success with birthday emails. Check out Pinterest to see some great examples of birthday emails from various companies. Be sure to personalize your email. Try merge tags to greet subscribers by their first name. If you have a connected store, add promo codes or product recommendations to your emails to encourage subscribers to buy something or visit your store. Take a look at your automation report anytime to see how well your birthday automation is doing, and how much revenue it’s earning for your business. To change things up at anytime, you can pause and edit your automation. Learn how to create an automated welcome email with Mailchimp's handy automation tool.